Do you remember this exaggerated dramatic scene of Forrest Gump, when he finally frees hisself from the chains of his leg braces? When he finally could run like the wind blows and feels free like a bird, cheered on by the love of his life Jenny (could it get more pathetic?). RUUUUUUUN FOOOORRREEEST RUUUUN! Yes, that scene. 10 days ago I experienced this feeling and no, I didn't get the star role for a remake of Forrest Gump. 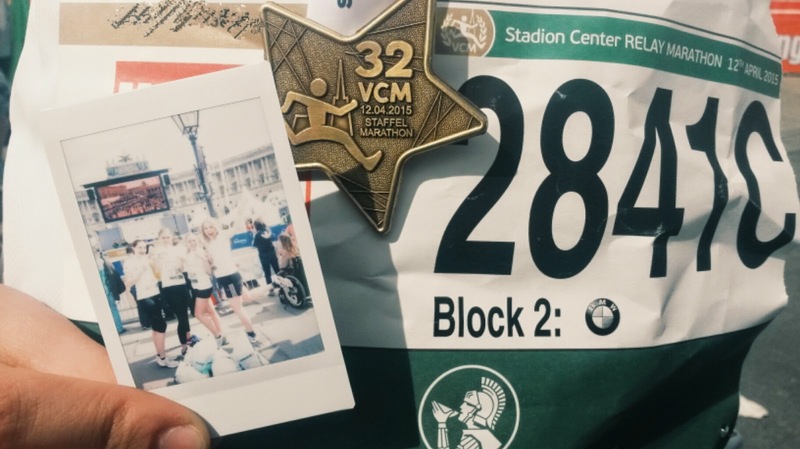 I got sporty: I ran the Vienna City Marathon!!! Wohooo! Ok, I have to admit, it were only 16,1 km, but Hey: Better than my usual Nutella session in the morning! I had the pleasure to start with 42742 other motivated crazy wonderful people, before getting superseded by my three university beauties, who formed a relay together with me. I really saw such a impressive scenery of Vienna while running (Definitely a better one than these lazy touries in these embarrassing red tourie busses). I felt like the mint leaf in a mojito, one tiny floor of the Burj Kahlifa or the frosting of a cupcake; not as a lone fighter, rather as a small part of something really big! Of course this outstanding feeling didn't last the whole run, there were also moments I'd loved to steal a Vespa on the side of the road and drive to the next Thai massage. Especially during the last five kilometres, when Spotify had to make my life more difficult by playing songs like SOS, Highway to Hell or Chasing Pavements (Lyrics: "Should I give up, or should I just keep chasing pavements?" REALLY ADELE?!). As Forrest would say now: "Life is like a box of chocolates - you never know what you're gonna get. ", as I would say now: Random function of Spotify - Never ever again! To sum up, this day was a really special one to me, so emotional like a combination out of a visit to Disneyland, Miley Cyrus' video for Wrecking Ball and Mum's delicious Cheering-up-Tiramisu, when someone has another maths, chemistry or summerbody problem (last one: joooke) .